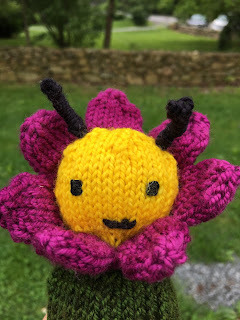 Susan B. Anderson’s Sweet Bee and Flower pattern found in Making Magazine Issue 5: Color is so darling. 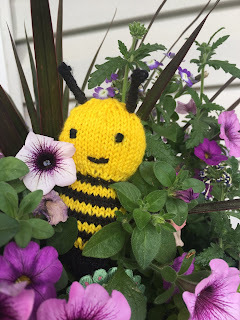 I love bees and knew right away I had to make this adorable bee. According to my little girls I wasn’t knitting fast enough for them because they were so excited to see the project finished. This little Bee is perfect to tuck in your flowerpots or in a small pocket. 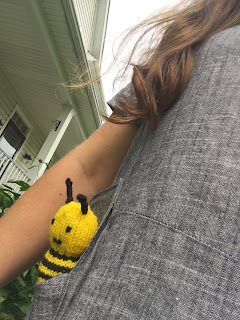 Thanks to the busy little girls our sweet Bee has been on many adventures and is having a wonderful summer exploring the garden. The little bee is great for tucking into pockets too! I used yarn I had in my stash to complete the Bee and flower. For the Bee I used Baaa! La Jolla in Black Pearl and Knitted Wit Gumball in Yellow. For the flower I used (a larger weight yarn but turned out fine for this) Ella Rae Lace Merino in Emerald and Medium Violet Red.